Have you ever looked outside on a lovely summer day and thought, “Geez! This would just be a perfect day to take the boat out!” only to remember that you don’t, in fact, own a boat? I mean, okay, you probably didn’t actually forget that you don’t have a boat, but you get the idea. Some beautiful days just call to your inner seaman, inspiring you to take to the water in whatever seafaring vessel you can find. But if you don’t have a boat? That life on the open water can be a hard dream to fulfill. 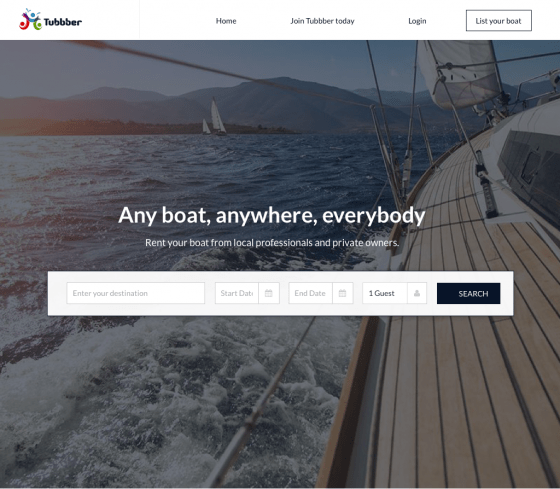 That’s where Tubbber, a new site that connects boat owners with people who want to rent them, comes in. Tubbber pre-launched last month at the International Charter Expo in Berlin, where they announced their initial 360 verified boats, and the’ll be officially launching publicly this month. They’re on track to have 4,000 boats around the world registered by next summer. The site itself bares some resemblance to AirBnB, which makes sense when you consider that Tubbber is about renting personal property to people you don’t necessarily know – except, instead of apartments or houses, they’re renting boats. Boat owners can make their boats available on the platform (for free) by signing up and filling out as much info as possible. The team at Tubbber verifies all of the boats, guaranteeing that the dream yacht you’re lusting after is, in fact, a yacht and not a bucket with a handkerchief for a sail. Tubbber also provides boat and skipper insurance as well as a place for secure payments between owners and renters, ensuring that everyone is protected throughout the process. Co-founder Anne de Vries has personal experience as a boat owner and as someone who has rented boats. He was inspired to start Tubbber after seeing some gaps in the market in a previous business. Tubbber hopes to reach young people especially, who may not be ready to commit to their own boats or may just want to try out boating every once in a while. One way the company is doing that is by taking only 3% of every transaction, a markedly lower percentage than most of the other boat rental agencies out there. So, if you’re hearing the call of the open seas but just don’t have your own vessel yet, head over to Tubbber and see if you can find the boat of your dreams, if only for a little while.